My parents spent the week of Thanksgiving with us and I wanted to make a few special recipes while they were here. This recipe for buttermilk buckwheat yeast waffles is amazingly delicious — fluffy waffles that are full of flavor. Everyone loved them and I even made them again today. And although you must start the recipe the night before you wish to make them, it’s well worth the effort. I had forgotten how much I loved waffles. My waffle journey started a few weeks ago when I discovered that the Cuisnart Griddler recently added waffle plates as a new accessory for the small appliance. I’ve owned my Griddler for a few years and am excited that it’s now a waffle maker in addition to being a griddle, grill, and panini press. Did I mention that it only takes 3 minutes to reach waffles of golden perfection? Before you go to bed, prepare the Day 1 ingredients. In a small bowl, combine the 1/4 cup of warmed water with the yeast. Stir in 1 teaspoon sugar and allow to sit until foamy (about 10 minutes). In a large bowl, combine the yeast mixture, buttermilk, salt, and flours. Stir until combined, then cover and refrigerate overnight. The mixture may increase in size by half, so use a bowl large enough to accomodate this. On Day 2, you’ll open the bowl to see a foamy. yeasty batter. The combination of buckwheat and yeast makes the batter rather thick and doughy, don’t be alarmed. Use a strong spoon to stir in the Day 2 ingredients, stirring until it’s all combined. At first you’ll wonder how it will be possible, but within a few minutes it will become silky (although it will still have some body). If you’d like, stir in any dried fruits or nuts. I tried a batch with dried tart cherries and walnuts. During the baking process, the cherries gather moisture and become plump — absolutely wonderful! Bake batter according to your waffle machine directions. 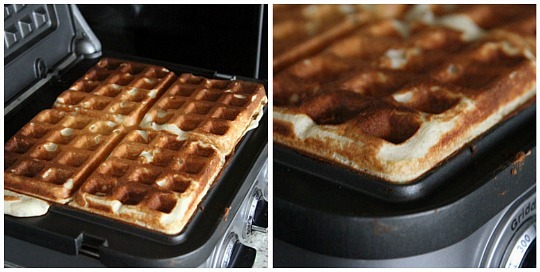 For the Cuisnart Griddle waffle plates, I used 1 1/4 cups batter per baking (four waffles) and baked for 3 minutes. This recipe makes four bakings for a total of 16 waffles. 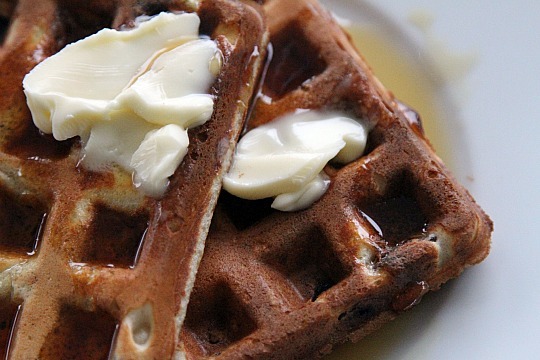 I grew up with buckwheat pancakes and wanted to bring the nutty nutritional flour to waffles. I’ve discovered that not all buckwheat flours are the same, with some being darker and more coarse (can give a gritty texture) while others are smoother and lighter. For these waffles, I used the latter — a smooth textured buckwheat flour but will try it at some point with a more hearty, darker buckwheat flour. 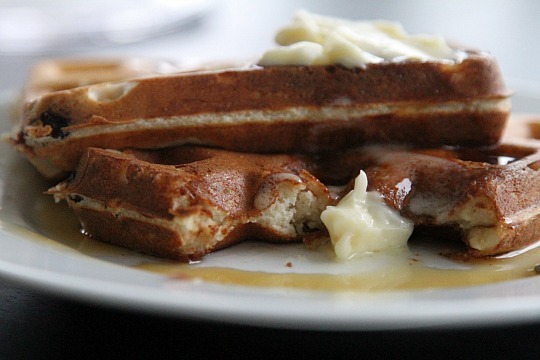 Waffles are easy to freeze and can be reheated using a standard toaster. I made and froze a batch of these waffles today so we can have a quick breakfast treat throughout the week. 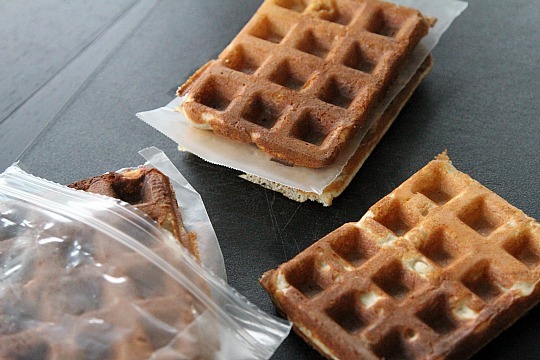 I packed two waffles per freezer bag with a piece of wax paper between the waffles so they don’t stick to each other. To reheat, just place the frozen waffles directly into your toaster. I toast mine on the medium setting which heats the waffles through and gets them crispy on the outside without burning. You’ll need to experiment with your toaster to find what works best for you.